It may only be early in the year but the racing season is certainly stepping up with the first marathon being run by one of our members. As always, I will begin with Parkruns which this week saw two of our members achieve PB’s. This was despite the terrible weather that Storm Gareth brought. At Sedgefield, Hannah Richardson secured a PB of 33.14 whilst at Darlington John Richardson secured a PB of 24.09. 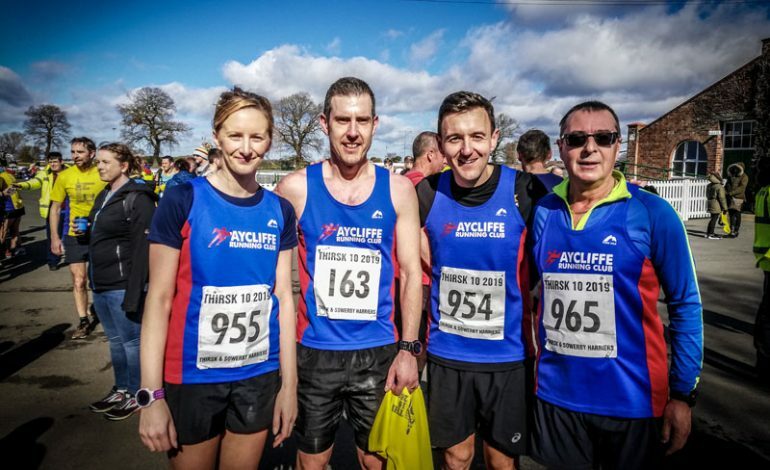 On Sunday we had a good turn out of runners for the Thirsk 10 mile race. This is a popular race which starts and finishes at Thirsk Race course. Fortunately the weather had improved significantly and whilst slightly windy in places it was overall a good day to race in and resulted in several members achieving PBs on this course. First home for the club was Richard Campbell in 1.04.50, followed by Paul Dalton 1.06.47, Andy Talbot 1.07.14 Tracey Surtees 1.07.49, John Surtees 1.07.50, Alex Lineton 1.12.13, Stuart Joyce 1.12.17, Rob Young 1.13.36, Trish Kay 1.22.10, Sandra Collins 1.27.42, David Stothard 1.32.34 and John Young 1.35.23. Also on Sunday Ian Baronowski made the journey to Wales for the Wrexham Marathon. This was not only his first ever marathon but the first in a challenge that he has set himself to complete one in each country in the British Isles. This race was made more difficult as a result of significant flooding but despite this Ian completed the marathon in 5 hours 6 mins and 9 seconds.